Understanding the underlying dynamics of a specific learning requirement, and then being able to map into a viable learning delivery approach, is fundamental to any successful e-learning project. The fourth part of the ‘Recipes For E-learning Success’ series was written in 2001 but many of the design principles still apply. E-learning can have a role in fulfilling any or all of these requirements. Understanding the underlying dynamics of a specific learning requirement, and then being able to map into a viable learning delivery approach, is fundamental to any successful e-learning project. The logistical demands of the company takeover (lots of people, very short space of time), probably mean that an overview document/presentation and Frequently Asked Questions (FAQ) document need to be distributed to everyone quickly. But this solution never answers all the questions or gets feedback from the organisation back to management. More importantly, it doesn’t allow the employees to feel part of the change process. Implementing a managed discussion forum to support the information delivery and to answer key questions would increase the effectiveness of communication considerably. Training a field-sales organisation is a constant need, and has a very high opportunity cost if the sales staff need to attend classroom training sessions on a regular basis. Electronically pushing information out to an already-overloaded sales staff does not necessarily provide an effective learning approach. 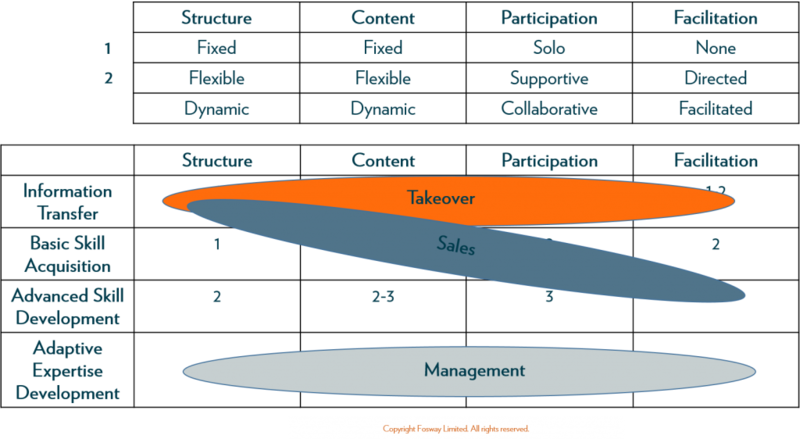 In this scenario, creating an online (e-)learning community which the sales team can access from their laptops would provide a better environment to manage learning and improve sales effectiveness. New product or legislative training can then be delivered in a controlled way on an ongoing basis. However, given the nature of the training and the audience, it is critical that this education isn’t just information push. The sales team needs the chance to discuss and understand the implications of the new products: how do they compare to the existing range or that of the competition? This e-learning environment needs to be actively facilitated to manage discussions and gather feedback. It also needs subject experts to provide direct support and answer questions. It needs content too; everything from product specifications and presentations to industry analysis, external references and specific customer experiences. Some of these items are provided by the sales team themselves, giving them an extra sense of ownership. This integrated environment then becomes a highly effective learning and development solution for the sales force and an ongoing reference tool. In the case of the senior management programme, there are likely to be key components which must be done face-to-face in a facilitated workshop environment, including peer discussion and review and input from external industry experts. The trouble is, to do this properly you probably need lots of time, typically 10 or more days, and that is just not feasible. What if we restructure it as an integrated e-learning programme? The face-to-face time can be reduced significantly, maybe to a two-day initial session, followed by two months of facilitated online collaborative and coached development, and then a final two-day session. Included in the facilitated session may be a number of online synchronous presentations and question/answer sessions with leading gurus, who may not be able to travel to meet with the participants. Whilst there may be pre-defined materials, much of the content and structure will develop during the workshops and online collaboration sessions. Resources of all kinds, particularly documents and references to external resources are critical, but are probably added as the specific context develops. Neither the audience nor the subject lend themselves to fixed structures or ‘click next’ content. The online environment is discussion and action-centric not content-centric – it is a learning community rather than a course. Focus is on outcomes not structure. At Fosway, we have developed models to enable us to better map the types of learning requirements based on our experience of many e-learning projects. Most importantly, these include approaches to understanding the learning dynamics underlying the specific requirement including structure, content, participation and instruction/facilitation. This information can then be constructed as an e-learning programme model and can be used to help us identify the appropriateness and role of associated technology support. We represent this mapping process using an E-learning Dynamics Matrix. The version below is simplified for ease of discussion, with a restricted set of e-learning characteristics and learning models. The matrix can be applied to defined learning requirements and gives us a clearer understanding of the relative role of the different components. 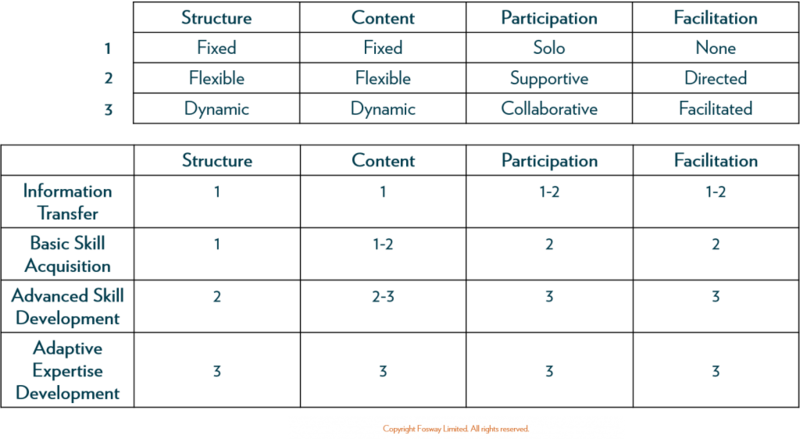 It tells us whether fixed learning structures are appropriate, whether content needs to be flexible in form (multiple types), and the degree of collaboration or instruction needed. 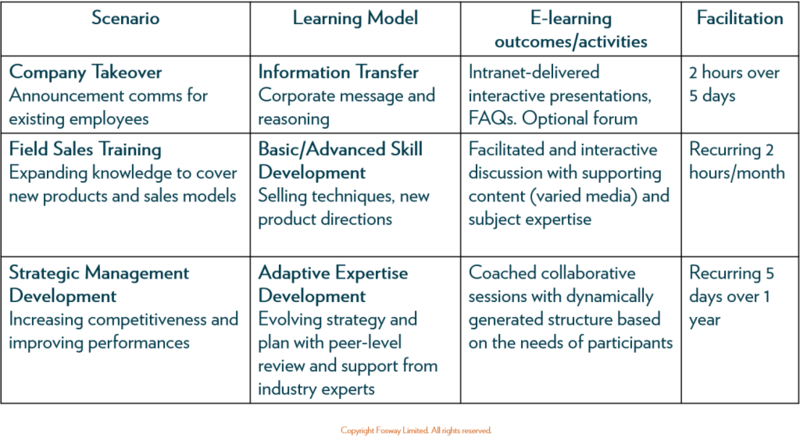 As you can see from the table, the application of the simplified E-learning Dynamics Matrix enables us to map from a Learning Model to an E-learning Outcome which outlines a learning approach and learning activities. This approach can then be mapped into an e-learning technical design, which defines the characteristics of the underlying technology and helps to determine the types of products we need. Of course, this mapping process is not the whole answer. There are other important factors, including the specific subject matter itself and how that lends itself to online representation. Also we need to consider the needs of the students, delivery logistics, technology and infrastructure, longer-term strategy and so on. But, by understanding the underlying nature of the learning requirement and the key dynamics of learning associated with it, we can at least start to map out a sensible way of delivering it, to ensure we are constructing an e-learning approach where we deliver real learning value.